A couple of years ago, I was sitting down on a Sunday morning reading my local paper. “What’s It? I don’t read minds, you know.” She’s always saying this, my wife. That she can’t read minds. She is under the impression that I think she should know what I’m thinking without my having to explain it. I ask her if it wasn’t one of the conditions of marrying her that she be able to read my mind, at which point she stops and, holding a soap-covered knife she is in the middle of washing, she gives me a blank stare. I obediently go back to my paper, impressed with the soap-covered knife—and with her stare, which is about as impressive as the knife. By the term “It,” of course, I mean the Education Reform Monster who goes into hibernation and comes out every twenty-five years or so to eat our schools. I explain this to my wife. “Oh,” she said, “okay,” and went on doing the dishes. We had already been through one attack of the Monster when our children were young. We had not originally intended to homeschool our children some twenty-five years ago when we sent our first child, a boy, to the local public school. Kindergarten was not bad. He learned nursery rhymes, fairy tales, and other classic children’s literature. They did the things in class that you would expect them to do in a kindergarten class. They learned to recognize letters and do some simple arithmetic. But by the next year, our school began to change. Our state legislature had passed a sweeping education reform program the year before that was influenced by the reform that had been making the news around that time. It was called “outcomes-based education.” A court case had been filed a few years previously to try to correct inequities in school funding from one district to another, but when it got to our State Supreme Court, the justices ruled that our whole system of schooling had to be changed. In came the education consultants. Educational experts from impressive places descended on our Commonwealth to advise our state’s lawmakers on what they should do to change our schools. The result was a wholesale transformation of what school was for. The education system was turned upside down. By the time our oldest child had reached first grade, the new educational regime was in place, and the new education ideas were being implemented. I had taught our oldest how to read, so when he arrived in first grade, we figured this would stand him in pretty good stead; the teacher would be impressed, and he would have an easy time. But what transpired in the classroom was very different. Among the newest things at this time was something called “whole-language instruction.” When my son was given a simple book to read by the new teacher, he began reading and sounding out the words as he went along, which was what we had taught him to do—to read phonetically. But the new teacher was not impressed. In fact, she was not happy at all. He was not to sound out a word when he came to one he didn’t know. He was to first observe the context of the word, to think of the other words he knew in the surrounding sentence, and think about what the paragraph was about. He was supposed to look at the shape of the word and see if there was anything about it he recognized from other words he knew. There were, in fact, about four steps he was supposed to go through before actually sounding out the word. Spelling instruction in this class was equally exotic. He would come home with papers of things that he had written with comments such as “I love your best guess spelling!” adorning the page on which my son had misspelled several words. 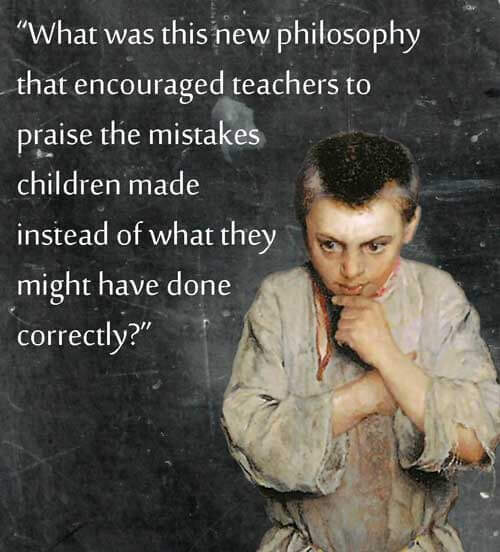 What was this new philosophy that encouraged teachers to praise the mistakes children made instead of the things they did correctly? My son learned very little that year, but my wife and I learned plenty. We ended up pulling him out of public school and putting him in a local private Christian school that emphasized basic skills and religious instruction. Like our other three children, he experienced a mix of private and homeschool instruction until he reached college. But my own child’s experience piqued my interest. I worked with a conservative public policy organization at the time the new reforms began changing our schools. And I began investigating exactly what this “new” education was. In the ensuing several years, other aspects of this “new” form of education became apparent. Teachers were not only no longer allowed to teach formal grammar and spelling, but they were not to correct their students’ papers for these things because this would stifle their creativity. Teachers were not to stand up in front of their classrooms and teach, but to play the role of “facilitator” in the education of the children in their classes, because children needed to be “active learners” rather than “passive learners.” And students were supposed to choose what they learned through “learning centers” rather than have the teacher directly tell them what they were supposed to do. Individual subjects were out too. Projects and unit studies would replace them. The “rote” memorization and “boring” drill and practice were to be abandoned. These, parents were told, were not only not conducive to learning, but were impediments to it. And then there was the abandonment of the traditional curriculum: the shift from classic literature to amorphous books by unknown authors and the neglect of the standard history curriculum. In fact, there seemed to be no curriculum at all. Every one of these changes—the back-away from basic skills, classroom methodologies that took the teacher out of the role of directing the classroom, the shift from tried-and-true disciplines toward “hands-on” methods, and the abandonment of traditional methods of knowledge acquisition and a curriculum—all of these, parents were told, would help the acquisition of knowledge. All of the “new” practices which were to replace these hoary methods of old were sprayed with the thin rhetorical veneer of science. They were “research-based,” and if parents only knew what the experts in colleges of education knew, they would be assured that this was the best way to educate children. As it turns out, these methods had no compelling research backing. Nor were they new. 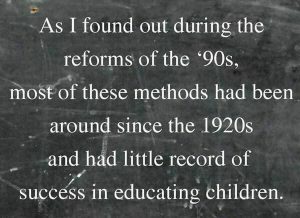 As I found out during the reforms of the ’90s, most of these methods had been around since the 1920s and had little record of success in educating children. Many veteran educators had seen them come through the schools as recently as the late ’60s and early ’70s with open classrooms and the New Math. In fact, almost every one of the supposedly “new” methods of education can be traced back to three documents, all of them written before 1930: “Cardinal Principles of Secondary Education,” written by the Commission on the Reorganization of Secondary Education in 1918, and “The Project Method” and “Foundations of Method,” written by William Heard Kilpatrick in 1918 and 1925, respectively. Little has changed except the labels, and even some of these were left as they were, figuring that twenty or twenty-five years was sufficient time for parents to forget how badly they had worked the last time they came around. How did I know this? Because here I was, in the second decade of the twenty-first century, hearing the same warmed-over rhetoric I had heard twenty-five years before. Under the guise of what is now being called “Twenty-First-Century Learning,” the permissivist program we had seen in my first child’s classroom in the early 1990s—and which had been tried at least three times before—was being marketed as the newest education thinking. The first thing to say about these permissivist reforms is that the practices the reforms say they want to replace have long been banished from the nation’s classrooms. In the opening chapters of Charles Dickens’ Hard Times, Thomas Gradgrind looks out on his class and proclaims to a colleague: “Now, what I want is, Facts. Teach these boys and girls nothing but Facts. Facts alone are wanted in life. Plant nothing else, and root out everything else.” Where can we find a modern Thomas Gradgrind? Although this is the image the reformers want to create of the classroom out there, it is almost exclusively a figment of their own imagination. As E. D. Hirsch points out in his book The Schools We Need and Why We Don’t Have Them, reformers “continue to assume that teachers are still giving lectures to docile classes lined up in rows, are still forcing children to engage in rote learning,” and are still insisting on mere accumulation of facts. In fact, says Hirsch, these practices have been frowned upon in education colleges, professional journals, and in teacher lounges for decades, the victim of the animosity that has characterized the education establishment since the 1920s. The second point is that, far from suffering from an overdose of memorized knowledge—facts being drilled into their tiny little heads—today’s students suffer not from an overabundance of knowledge, but a decided lack of it. National surveys have shown repeatedly that American children don’t know basic facts about history, geography, and literature, and don’t do well in mathematics in comparison with many nations which, ironically, stress rote memorization and drill and practice. Our educational establishment—the one that we have charged with transmitting the acquired knowledge and wisdom of the ages—is, it turns out, not very interested in doing this. It is interested instead in “learning styles,” “projects,” and “unit studies,” “child-centered learning,” “learning centers,” and “critical thinking skills”—and in liberating students from, not familiarizing them with, our civilization. Long relied upon to transmit knowledge of the past to upcoming generations, our schools today appear to be about a different task. Instead of preserving the past, they more often disregard it, sometimes in the name of “progress”—the idea that today has little to learn from yesterday. But usually the culprit is “process”—the belief that we can teach our children how to think without troubling them to learn anything worth thinking about, the belief that we can teach them how to understand the world in which they live without conveying to them the events and ideas that have brought it into existence. When my second son came home from college in the middle of his first year and announced that he wanted to become a teacher, I told him that was fine with me as long as he didn’t become an education major. “Why?” he asked. Because of this emphasis on the how of education rather than the what, we are not passing on our culture to our students, nor are they acquiring the basic linguistic and mathematical skills they need to do well in their lives and occupations. Given that the problem education reformers are always trying to solve is the opposite of what the problem really is, such reforms are more likely to make things worse, not better. If the problem is not too much rote memorization but a lack of general knowledge; if the problem is not too much “boring” drill and practice but too much clay and paint and coloring books; if the problem is not too much emphasis on separate subjects but a chaos of disconnected information about which children cannot make sense, then fighting these illusory problems with more of what we are already doing in classrooms will not make things better, but worse. Classical education saw as its goal to teach children the basic skills of reading, writing, and arithmetic, wisdom and virtue through literature and history, and advanced intellectual skills (what modern educators unknowingly call “critical thinking skills”) through the liberal arts. Classical education wasn’t abandoned because it didn’t work; it was abandoned because new ideas took hold of our education establishment­—ideas that, as it turns out, don’t work very well at all. I consider Charlotte Mason to be a classical educator in the sense that she adapted it for homeschoolers. She can look like a progressive sometimes, but only because, if we took what she was able to do in a homeschool context and tried to do it in an institutional context, it WOULD BE progressivism. But as far as I know, she never proposed that. You can do things in a homeschool that you can’t do in a day school. As far as I know, she realized that.